City Home is an artfully curated collection of all things vintage inspired! When trying to capture the true essence of Portland’s quirky feel and personality, there is no better area than the Central Eastside Industrial Shopping District. At the heart of it all, you’ll find City Home on SE Taylor St and SE 2nd Ave; a unique furniture and home decor showroom that truly captures the Portland vibe. Established in 2013, City Home opened as a vendor in a community shop on Grand Ave. In less than two short years they’ve exploded onto the east-side shopping scene and opened two full warehouse showrooms of their own spanning more than 20,000 square feet. Founder and owner Kim Pelett started City Home with her partner Karen Shea-Connell after Pelett ended her 30 year run as the owner of Classic Home & Antique, formerly on SE MLK in Portland. Pelett’s idea for City Home was to utilize her experience and knowledge of the furniture and decor business to build something truly unique that steps away from old antiques and breathes new life into the mid-century-modern, vintage, industrial, and reclaimed styles of 2015. When entering City Home for the first time it’s easy to see Pelett’s expertise. The showrooms instantly grab your attention with so many great finds! Every item, whether it be a piece of furniture or something completely unique like geodes or trophy skulls, has a sense of quality. Nothing in either of the two City Home showrooms feels cheaply made. Exotic lighting and chandeliers are everywhere you look. Barstools and chairs are available in many different styles for bars and home use alike. Top quality sofas, tables, and all kinds of other furniture fill the rooms, with abstract home decor displayed in every direction. City Home is an artfully curated collection of all things vintage inspired! City Home’s annex location at 217 SE Taylor opened less than a month ago and already it has the vibe and special touch found in their first store at 139 SE Taylor. After only a few weeks of renovation, their new warehouse and showroom has filled up fast. Featuring the latest from JoyBird Furniture, specializing in 1950’s - 1960’s throwbacks, and local importer Porter International Designs that specializes in contemporary and reclaimed styles. 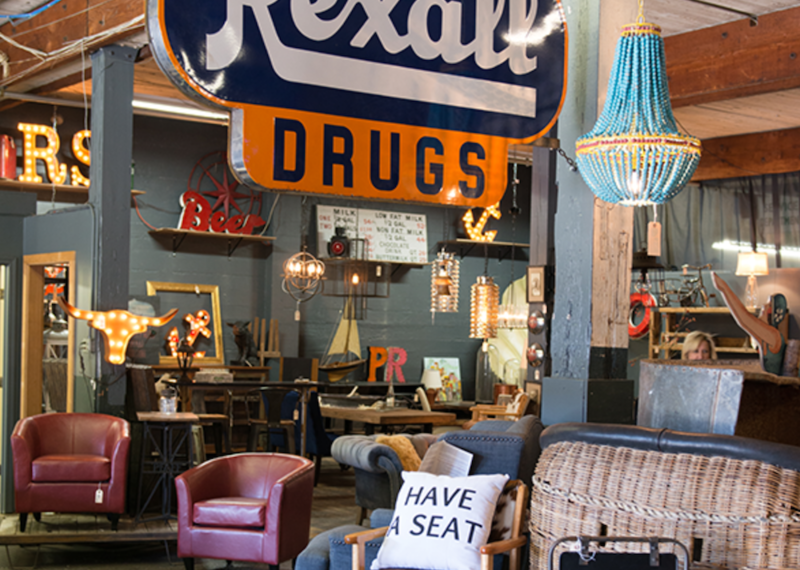 With so many original partners, City Home showcases some of the best finds in Portland. With so many furniture and home decor stores to choose from, it can be overwhelming to know where to begin when you're looking to furbish you home. Though if you're looking for the famous Portland feel and a unique style no-one will be able to match, be sure to stop in to City Home the next time you're over on the Central Eastside in Portland. City Home is located at 139 SE Taylor St. and 217 SE Taylor St in Portland, OR. They’re open Monday - Saturday from 11am - 5pm and Sundays from 12 - 5pm. Find them on social media at facebook.com/cityhomepdx, pinterest.com/cityhomepdx, and instagram.com/cityhomepdx. Visit City Home’s website at cityhomepdx.com.